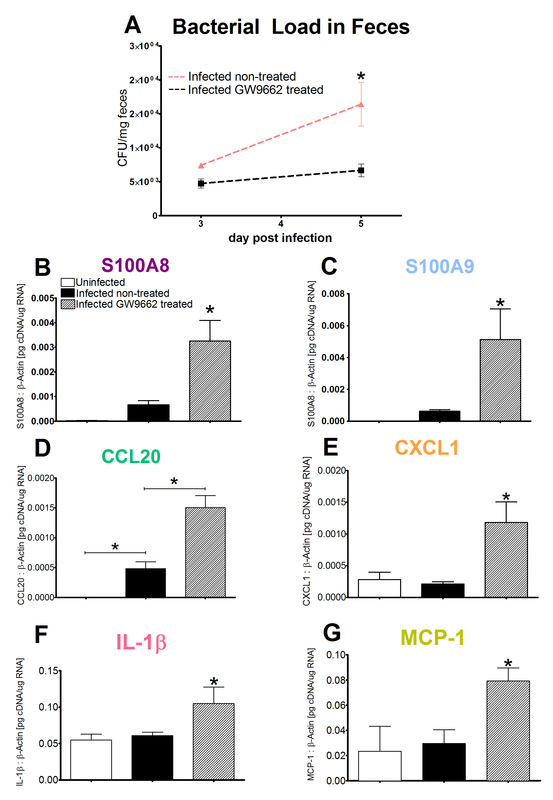 The CD4+ T cell differentiation process activates the transcriptional and secretory cellular machinery that helps orchestrate immune modulation in infectious, allergic and immune-mediated diseases. 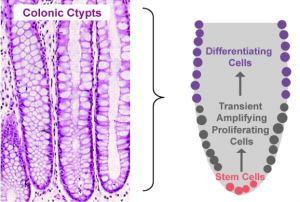 Upon antigen presentation, naïve CD4+ T cells become activated and undergo a differentiation process controlled by the cytokine milieu in the tissue environment. For instance, interleukin-6 (IL-6) in combination with transforming growing factor β (TGF-β) trigger a naive CD4+ T cell to become a T helper 17 (Th17) cell. In contrast, TGF-β alone can activate regulatory pathways leading to differentiation of naive CD4+ T cells into an induced regulatory CD4+ T cell (iTreg) phenotype, which in turn tightly dampens effector and inflammatory responses. 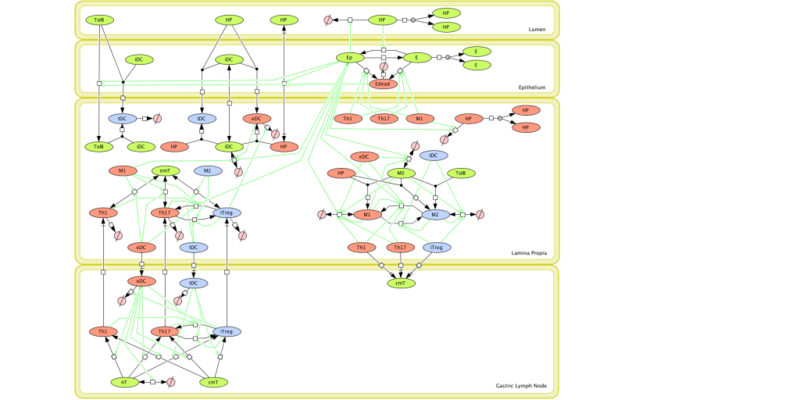 Due to the complexity of this process, MIEP has constructed a computational and mathematical model with 60 ordinary differential equations representing 52 reactions and 93 species that makes a CD4+ T cell differentiating into either Th1, Th2, Th17 or iTreg (Figure 1). 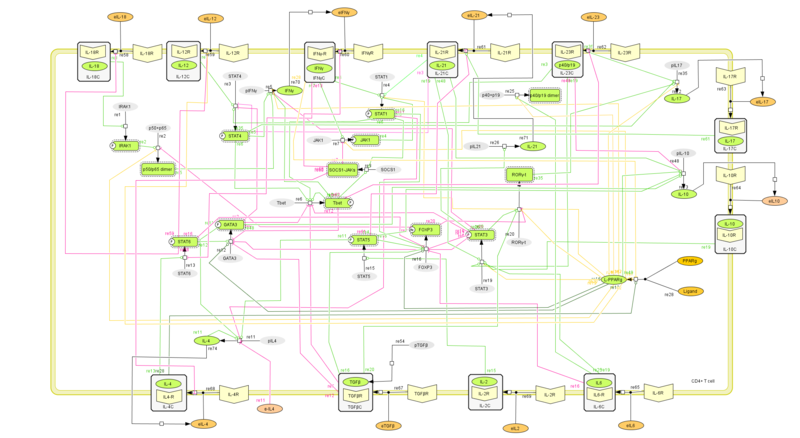 The interactive model network can also be found here . Our model includes cytokines, nuclear receptors and transcription factors that define fate and function of CD4+ T cells. 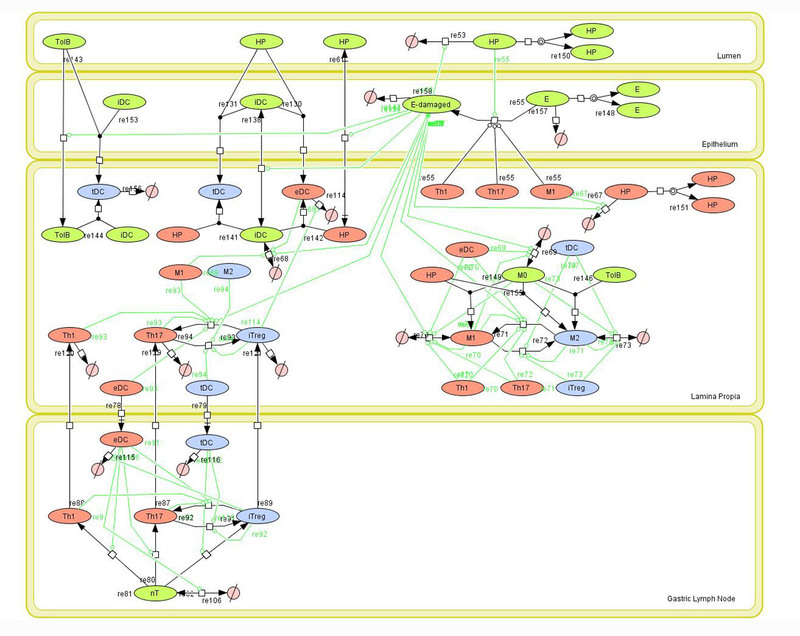 The model was calibrated with experimental data and it properly computes the four phenotypes with up- or down-regulation of cytokines and transcription factors that are a trademark of each phenotype. 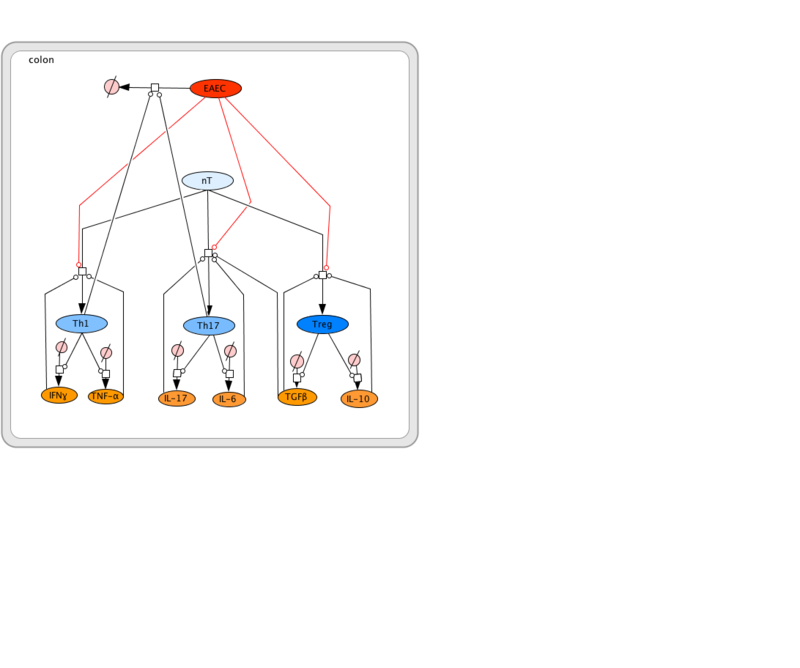 More information is provided in the CD4+ T cell modeling section. Therefore, the user can choose how the model can be initialized and thus, induce the system into a phenotype or another. Alternative inductions can also be tested and internal parameters and concentrations can be read. 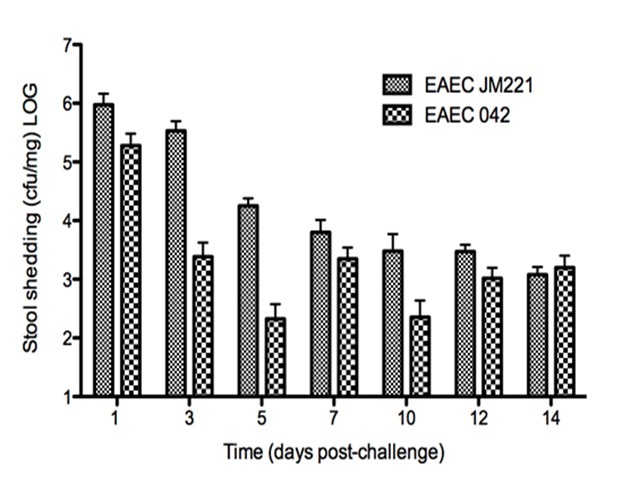 The first set of validation studies were focused on the switch from Th17 to iTreg in differentiated wild type or PPARγ null Th17 cells upon activation of PPARγ. 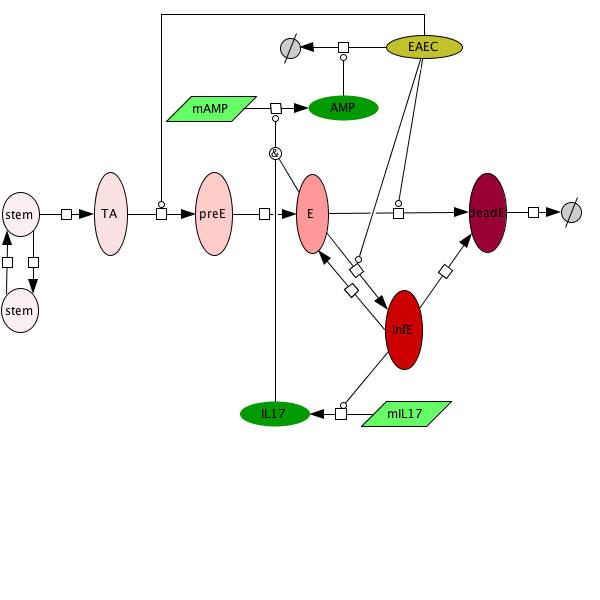 Our computational simulations showed that increasing concentrations of PPARγ in the Th17 cell in silico led to downregulation of RORγt and IL-17 and upregulation of FOXP3 (Figure 2A). In line with this result, following induction of Th17 and PPARγ activation, IL-17, STAT-3 and RORγt were dramatically downregulated, whereas FOXP3 was upregulated, thereby demonstrating a phenotypic switch from a Th17 to an iTreg phenotype (Figure 2B). 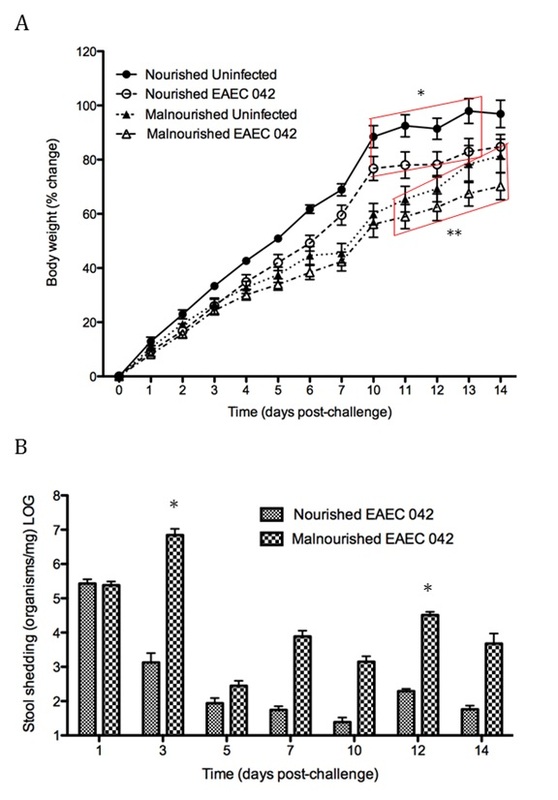 To ensure that parameter space scan and time-course were linked and the changes in PPARγ were being observed in a time-dependent manner, a combination of both was run, reiterating the phenotype switch with increasing concentrations of PPARγ over time (Figure 2C). 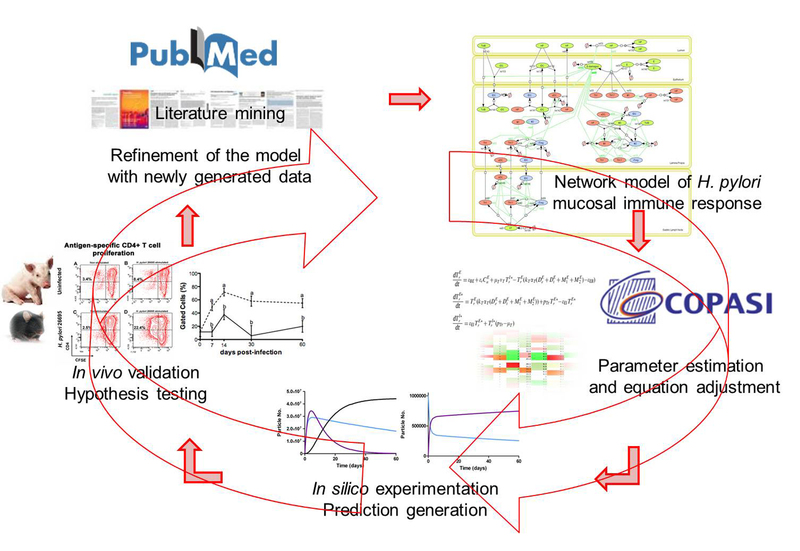 The in vivo studies were focused on elucidating the effect of the loss of PPARg in CD4+ T cells to validate our knock out in silico models and to validate the therapeutic role of pioglitazone on the plasticity context on adoptive transfer animal models given by the predictions in silico. To determine whether the loss of T cell PPARγ favors Th17 and impairs iTreg cell differentiation and also to assess whether T cell-extrinsic mechanisms might be affecting iTreg upregulation we conducted computational simulations and in vivo studies of PPARγ deletion in T cells. Chronologically, a PPARγ-deficient naïve CD4+ T cell was created in silico by blocking PPARγ downstream signaling. 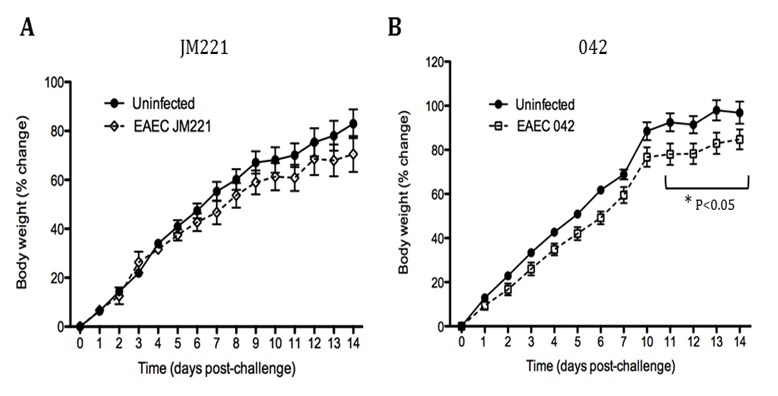 The loss of PPARγ in silico caused upregulation of RORγt and IL-17 in Th17 cells (Figure 2E) and down-regulation of FOXP3 in iTreg cells (Figure 2G) compared to wild-type CD4+ T cells (Figure 2E and 2F). These results demonstrate that PPARγ exerts a regulatory role in CD4+ T cell differentiation from a naïve state to Th17 or iTreg cells. Next, to validate this computational prediction, we sorted CD4+CD25-CD45RBhigh naïve T cells from spleens of donor wild-type and T cell-specific PPARγ null mice and adoptively transferred 4 x 105 viable cells to SCID recipients. 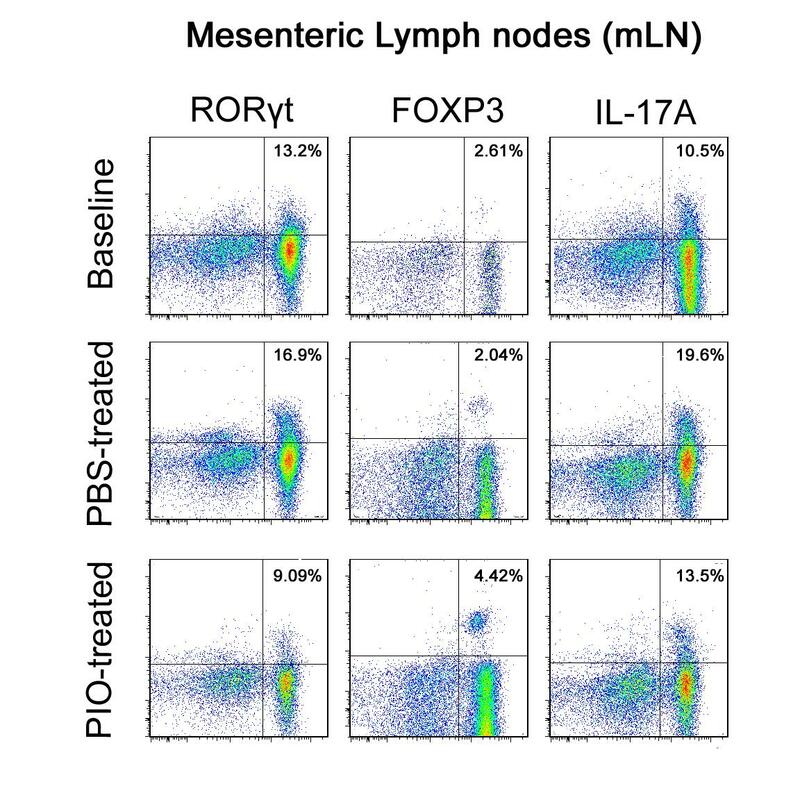 Cells isolated from the colonic lamina propria (LP), spleen and mesenteric lymph nodes (MLN) of recipient mice were assayed for expression of FOXP3, RORγt and IL-17A by intracellular flow cytometry. 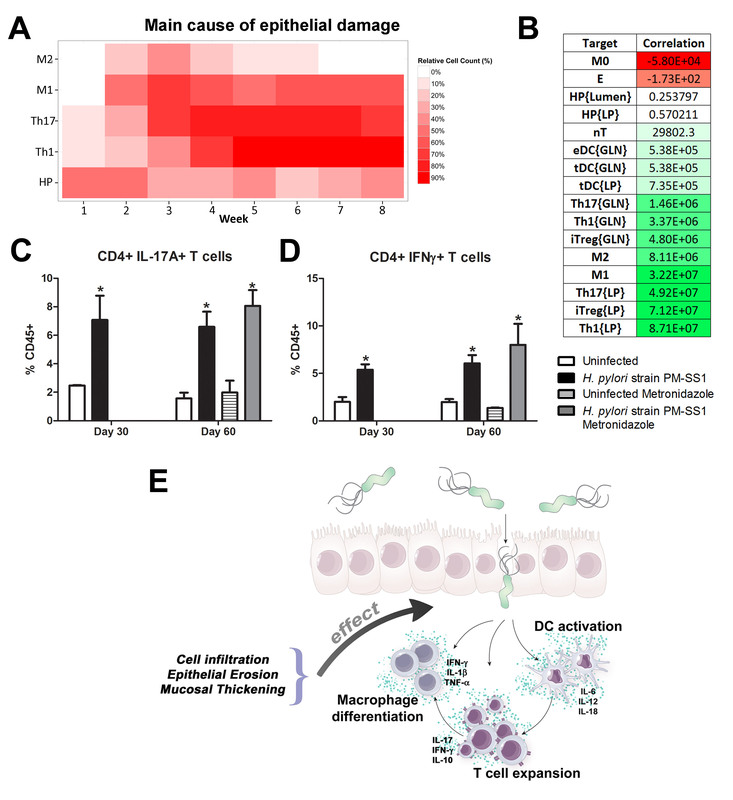 The transfer of CD4+ T cells lacking PPARγ resulted in significantly greater accumulation of IL-17-producing Th17 cells and lower levels of FOXP3+ iTreg cells in spleen, MLN and colonic LP of recipient mice. To validate the computational prediction that pharmacological activation of PPARg leads to a phenotypic switch from Th17 to Treg, we sorted CD4+ CD25- CD45RBhigh naïve T cells from spleens of donor wild-type mice and transferred 4 x 105 viable cells to RAG2-/- recipients. When clinical signs of disease and colitis appeared, a subset of mice was sacrificed and spleen, MLN and colons were extracted to examine Th17 and Treg levels (baseline results). 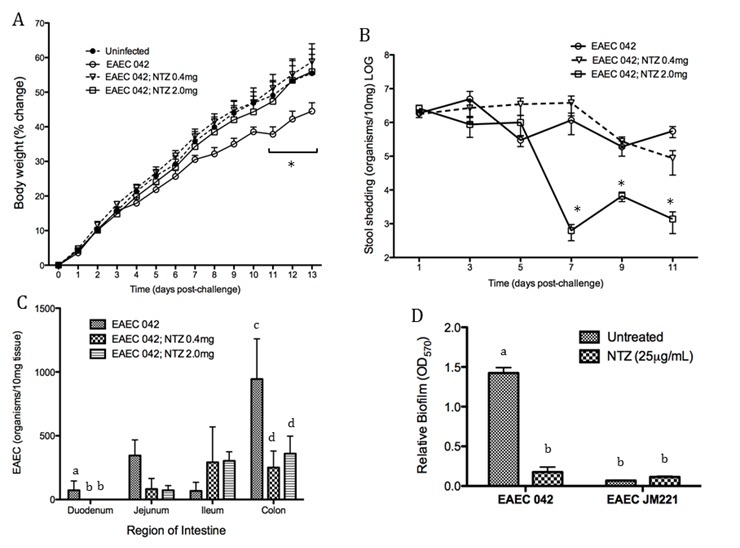 After verifying the presence of Th17 cells in colon, MLN and spleen, half of the mice were received a daily treatment of 70 mg/kg of pioglitazone given orally to activate PPARγ (Figure 3). During the treatment period, mice treated with pioglitazone recovered weight and their disease activity scores dropped significantly. Untreated mice maintained a predominant Th17 response characterized by increased levels of CD4+ T cells expressing RORγt and IL-17A. In contrast, pioglitazone-treated mice not only recovered from colitis and its associated weight loss, but also showed a switch from a predominant Th17 into an iTreg phenotype characterized by increased expression of FOXP3 and decreased IL17-A and RORγt in CD4+ T cells of the colonic LP (not shown) and MLN (Figure 4). This data supports the in silico prediction that activation of PPARγ in Th17 cells favors differentiation into iTreg cells, which facilitates colonic tissue reconstitution and recovery from disease. 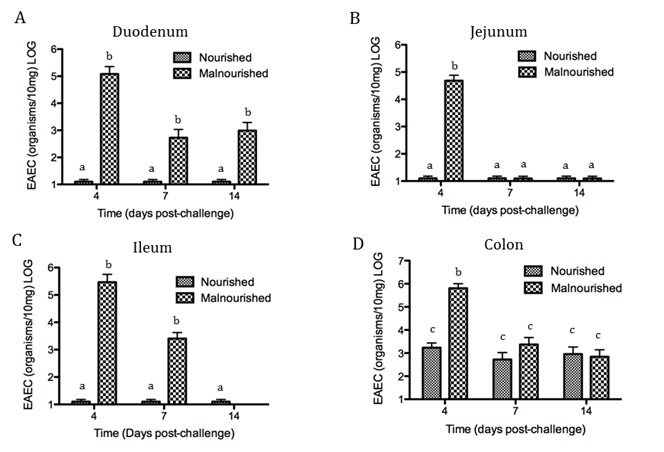 These results have been accepted by pLOS Comp Bio and can be found here and the model can be found at both Biomodels.net (ID: MODEL1304230001) and our website here. The CD4+ T cell model can also be re-calibrated and be adapted to specific studies. 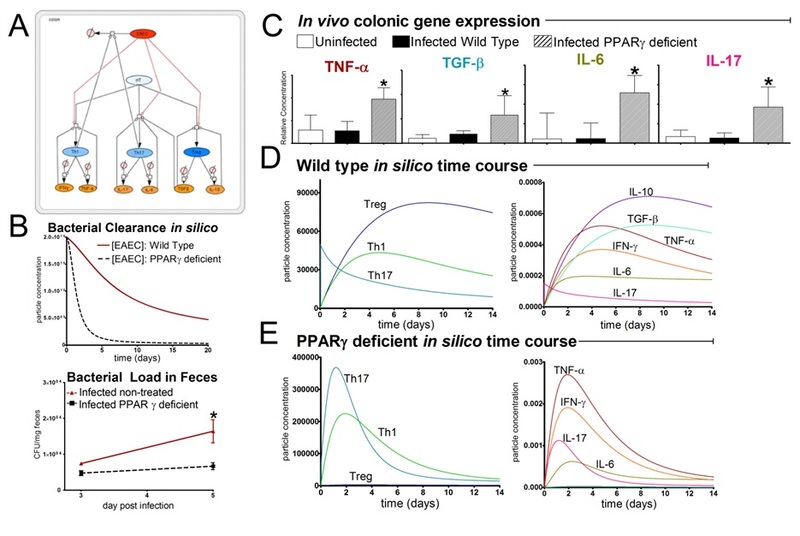 MIEP has re-calibrated the model with Helicobacter pylori infection data in collaboration with University of Vanderbilt to run simulations with the differentiation model and observe potential activation pathways that CD4+ T cells switch on one those are exposed to a pro-inflammatory environment due to the infection of H. pylori. 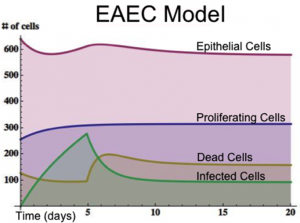 The CD4+ T cell differentiation model is available for download in CellDesigner XML format, compliant with SBML model formats, and COPASI format through the website. 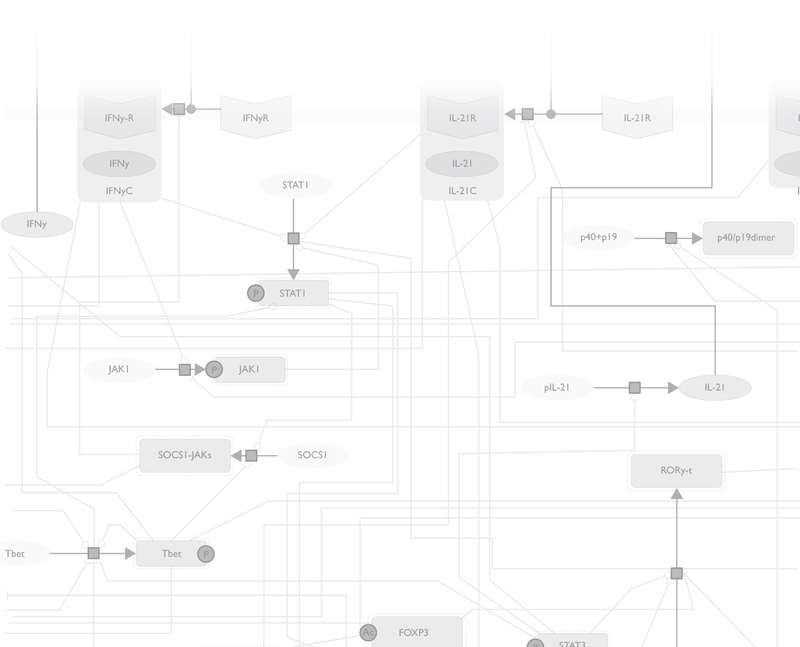 MIEP also provides the network on this page and navigation through the model is doable through a Google-Map-API-enabled CellPublisher user friendly interface (also generated by MIEP). MIEP demonstrated for the first time that activation of PPARγ results in reprogramming of the CD4+ T cell molecular pathways that control the Th17 phenotype, leading to the induction of an iTreg phenotype. 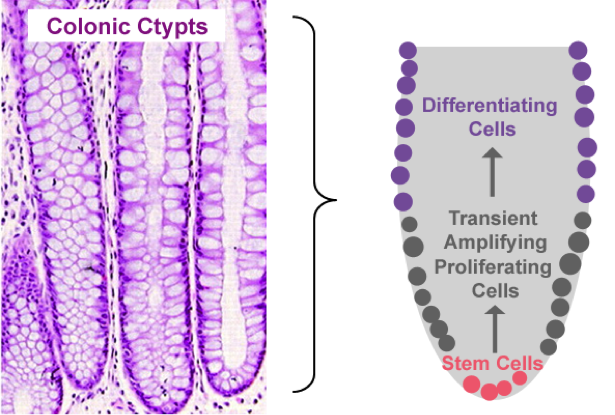 This phenotype switch is associated with protection from CD4+ T cell-induced colitis during adoptive transfer experiments in mice. Thus, the balance between Th17 and Treg cells helps delineate the outcome of immunological processes from effector inflammation to regulatory tolerance. 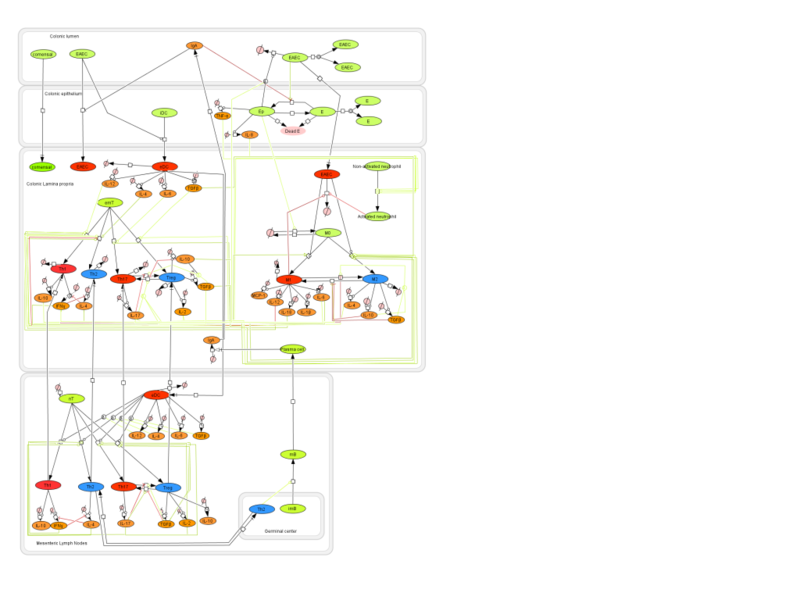 Our modeling approaches allowed us to narrow the design of experiments and to better understand the molecular mechanisms of action controlling CD4+ differentiation. 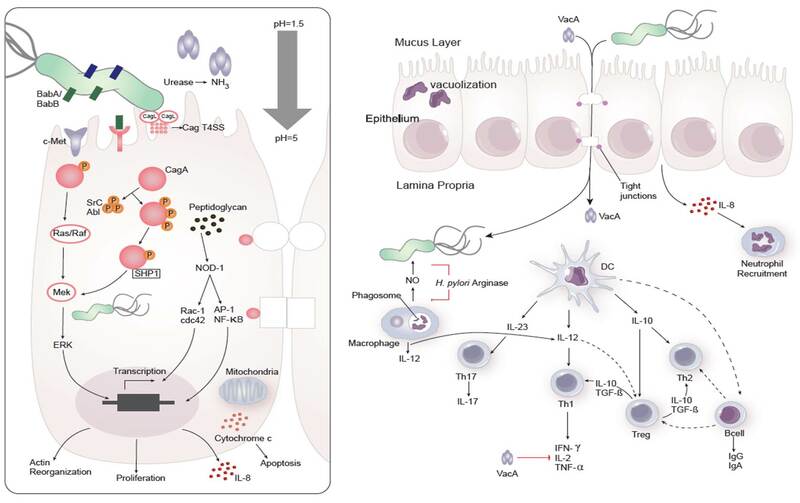 This new mechanistic knowledge is broadly applicable to the development of immune therapeutics for infectious, allergic and immune-mediated diseases. 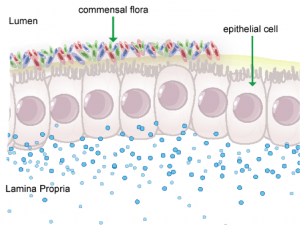 More specifically, we propose that PPARγ is a promising therapeutic target for chronic inflammatory and infectious diseases where Th17 cells contribute to the gut immunopathogenesis. Figure 2. 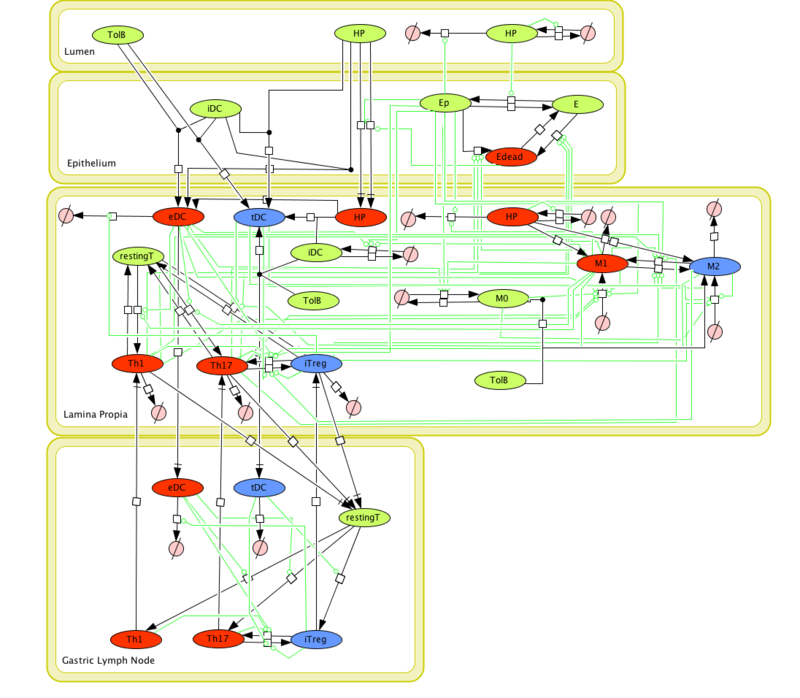 In silico simulations with the CD4+ T cell computational model. Figure 4. 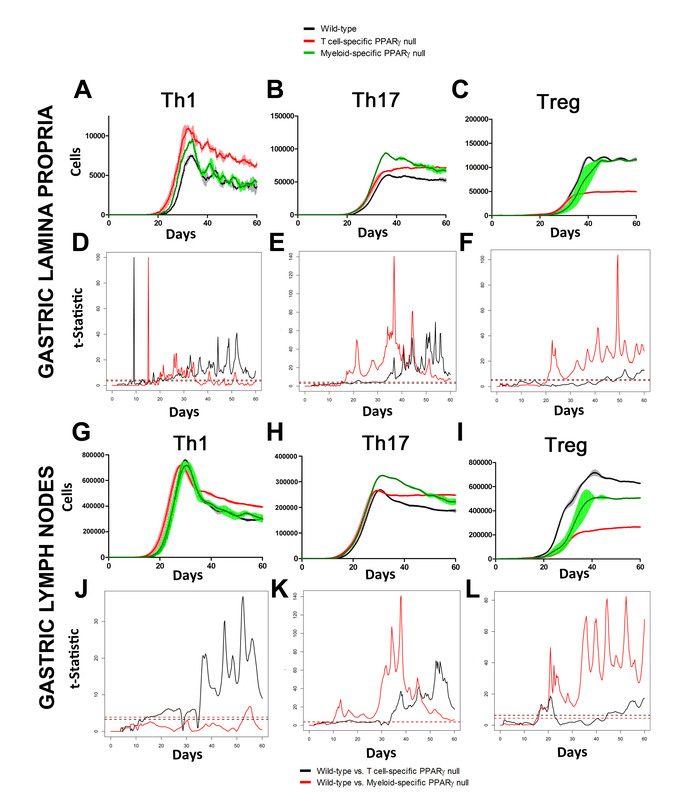 Accumulation of iTreg and Th17 cells in the mesenteric lymph nodes (MLN) of recipient mice. 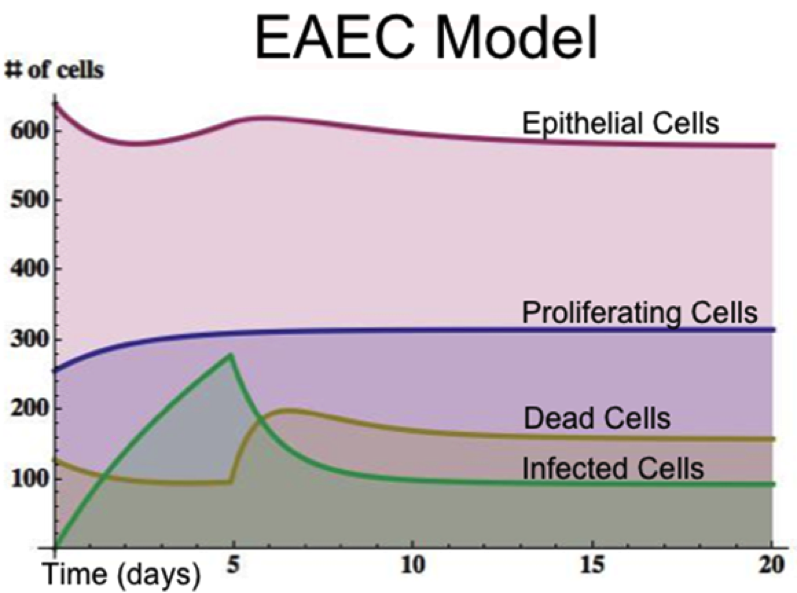 The MIEP team will utilize integrated modeling, bioinformatics (i.e., transcriptomics and proteomics) and immunology approaches (i.e., FACS, ELISA, proliferation and cytokine production assays) to characterize T cell responses to Helicobacter pylori and enteroaggregative Escherichia coli (EAEC). 1) Quantify antigen-specific immune responses based on cytokine production and proliferation following antigenic stimulation. 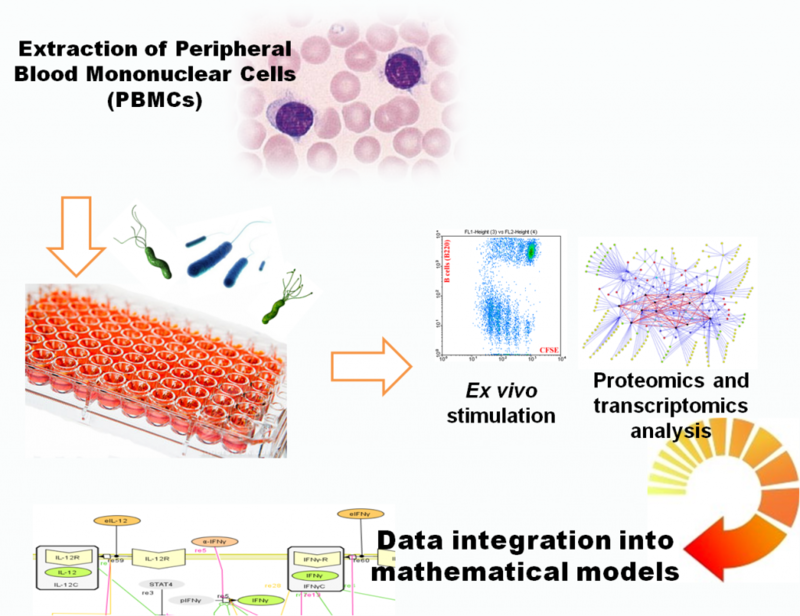 2) Perform high-throughput proteomics and transcriptomic analyses to evaluate the phenotype of these immune cells and how re-exposure to antigenic determinants from these bacteria modulates their function. 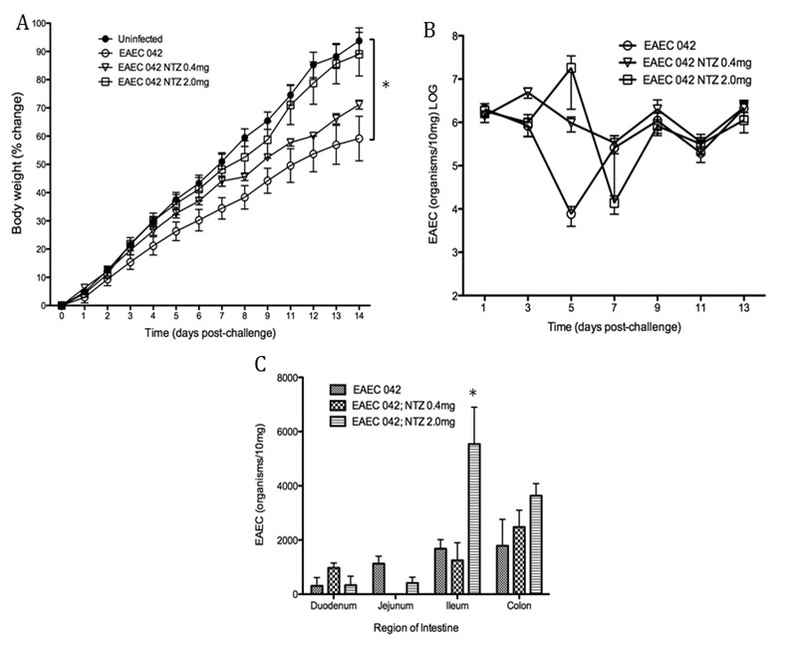 3) Test the effect of novel immune therapeutics on the activity of human PBMC. 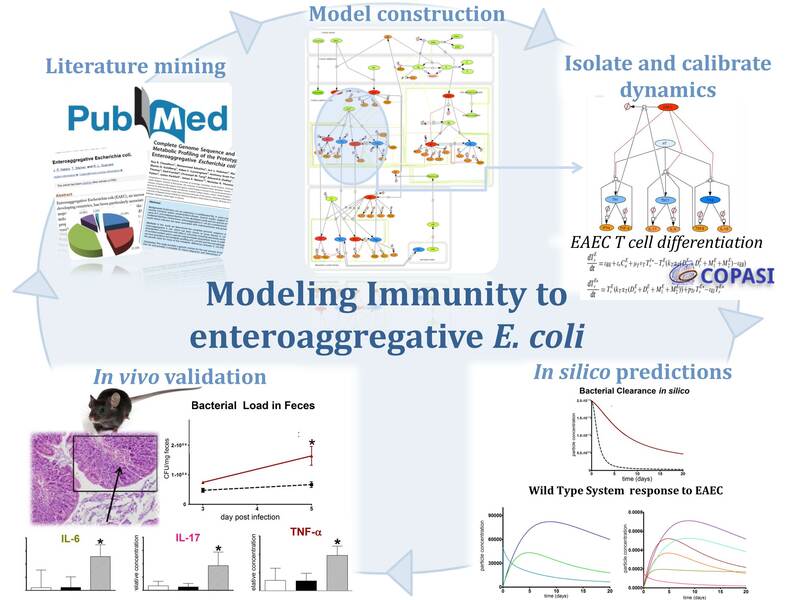 The immunological data generated will be used to calibrate and validate MIEP’s computational and mathematical models of immune responses to enteric pathogens. 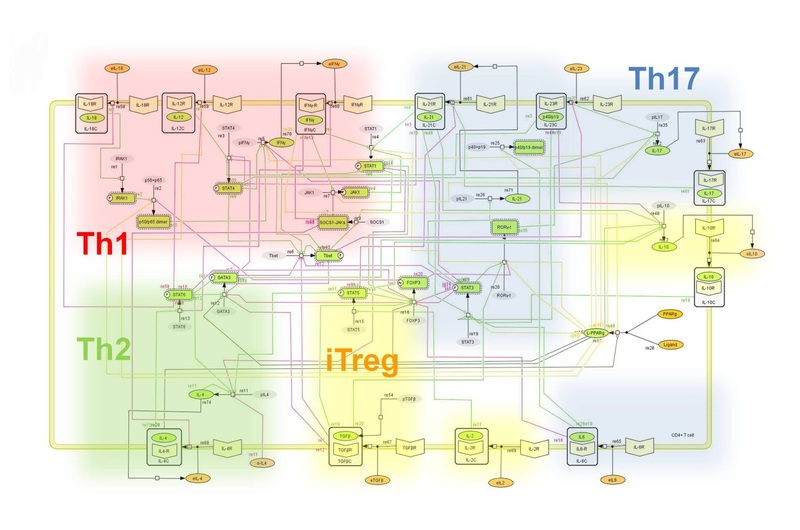 The full integration of the modeling, bioinformatics and immunology experimental approaches will facilitate the discovery of novel unforeseen therapeutic targets. Human subjects recruitment has been initiated. An announcement has been posted on Sept 28, 2011 to recruit volunteers who would like to participate in this project.